The first thing I notice about the Aftel Archive of Curious Scents is that it doesn't smell. Mandy Aftel, the museum's founder and the author of "Essence & Alchemy: A Natural History of Perfume," says this is not an accident. "I think people are worried that it will be very smelly like a department store," she says. Aftel tells me that the natural oils in her perfumes are not as pungent and long-lasting as the synthetic oils that you'd find at a makeup counter. 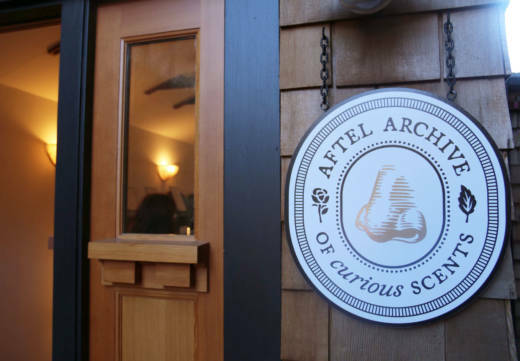 The Aftel Archive of Curious Scents was founded as a way to share her love of natural fragrance with the world. 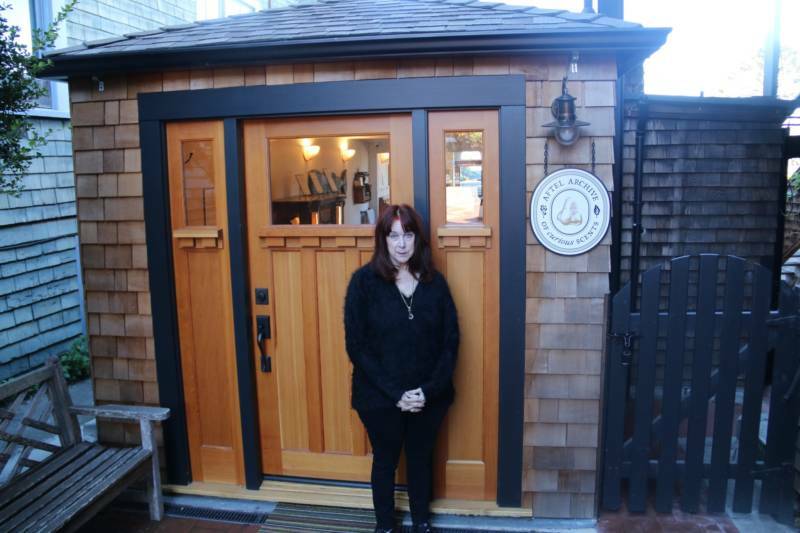 The small museum is in a garage behind her house in Berkeley, just over the fence from Chez Panisse. She’s practically vibrating with energy as she shows me around. Her all-black outfit is punctuated by her over-sized purple glasses and cherry-red hair. Aftel says perfume is more than just Chanel. Scented materials have been used in spiritual traditions from Buddhism to Catholicism, and Native American rituals. 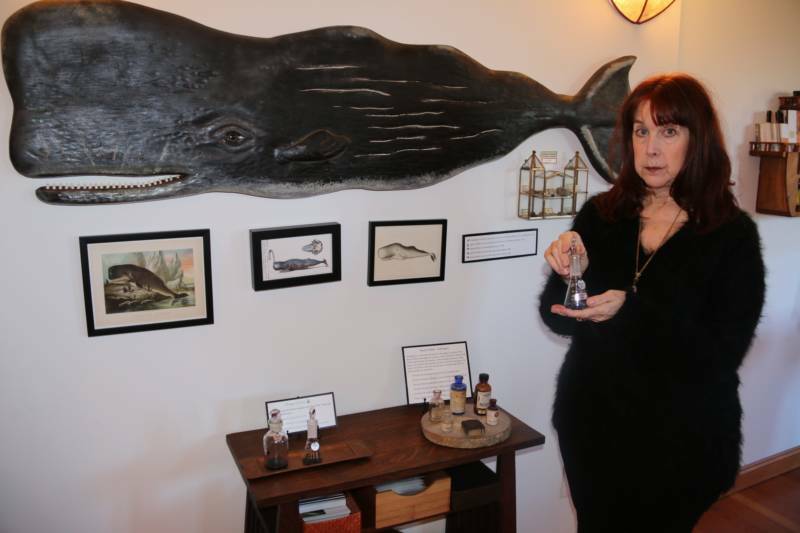 She has created nearly all of the 300 scents in the museum. "Perfume has a very tangled history," she explains. "There is no civilization that didn't revere and want scented materials." It turns out a lot of civilizations wanted one smell in particular, and she has it at the museum. It’s in a tiny bottle labeled “Smell Me,” underneath a huge wooden carving of a whale. I take a whiff and ask Aftel to describe what she thinks it smells like. She holds the bottle close to her nose. "It's got a kind of like a sparkly quality to the smell, if that makes any sense," she says. "And it's soft and deep but also light, and kind of feels like it reflects light. It's a kind of wonder." This kind of flowery language sounds like how someone would describe a fine wine, or gourmet chocolate. To me, the thing we’re smelling right now reminds me of a wet beach towel. 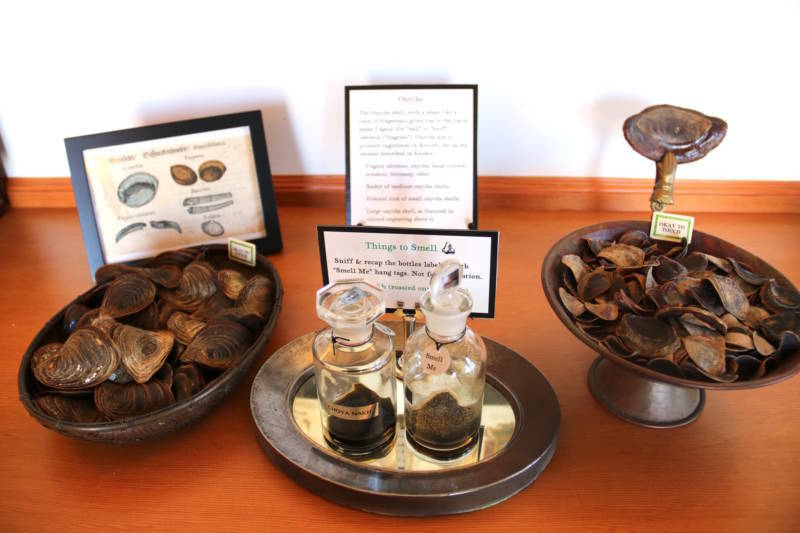 It’s ambergris, which is essentially sperm whale poop that has been used in perfumes for centuries. Aftel says this museum is all about touching, looking and smelling: "It just brings you a lot closer to nature and how incredible nature is with smells." And there is nature here. 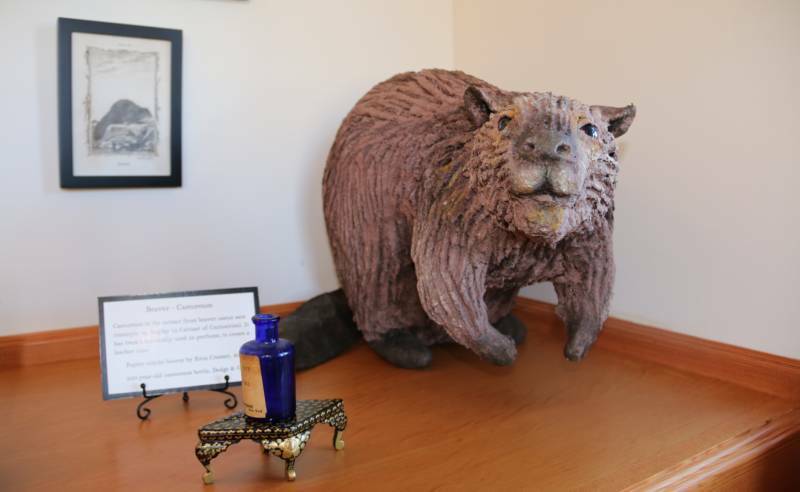 A taxidermed beaver sits in one corner, next to a small replica of a musk deer. Aftel says perfume has been made from the oils of these animals. 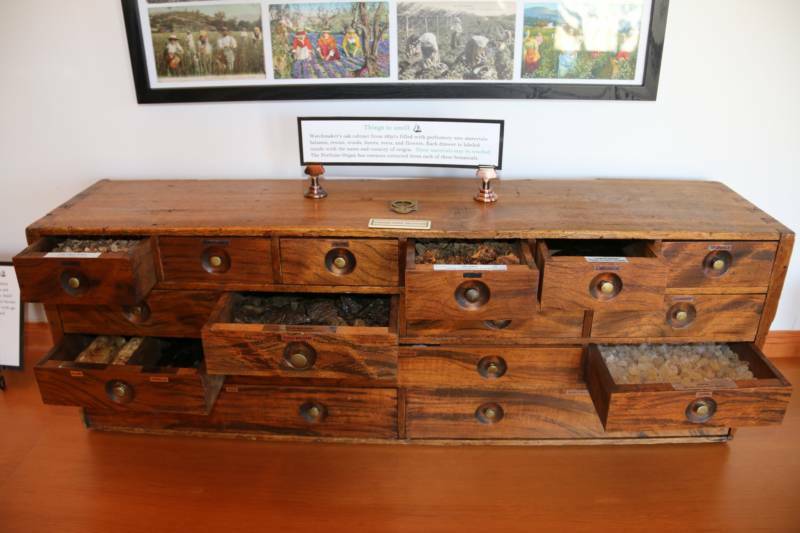 One of my favorite discoveries is a wooden chest of drawers filled with some of the raw materials that go into making perfume, like vetiver grass, juniper berries, cedar wood and sea shells. But the museum’s main attraction is the perfume organ. It looks like a pipe organ but it’s not a musical instrument. 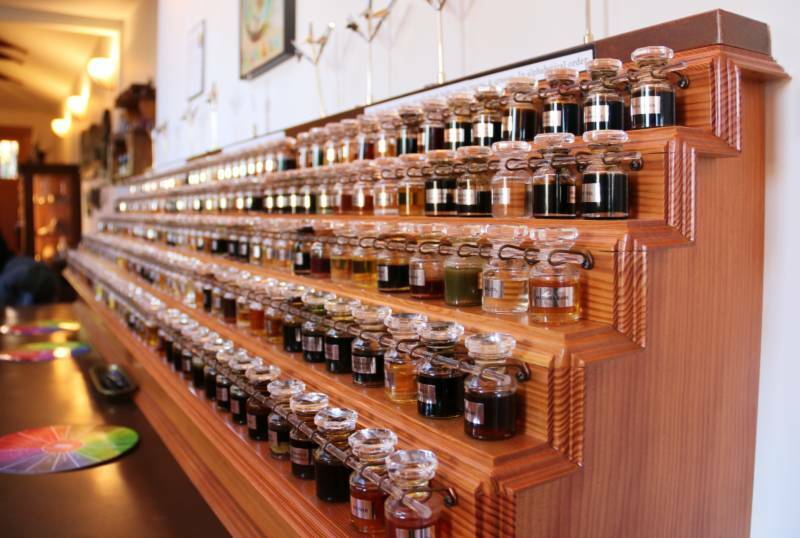 It’s like a giant spice rack, with three long rows holding hundreds of tiny glass bottles filled with colored oil. Every visitor to the museum gets three strips of heavy paper to dip into these bottles. I test out a bottle of poplar buds, which look like egg yolk and smell like ... apricots and baby poop. Not for me, but I do like the cardamom and jasmine oils. Before she turned to the world of perfume, Aftel worked as a therapist. She thinks the connection between smell and memory is so strong that visitors can be transported to another place after smelling something at the perfume organ. "It takes them back right away, like people have a smell and they have a memory and it just fuses together right then, kind of like music does for people," Aftel says. Even though the museum is open only one day a week, on Saturdays, she says she's had visitors from all over the world. But talking with Aftel, I get the feeling she would have been happy to have created this museum even if no one showed up.